Will The Xbox One X Outsell The PS4 Pro? With the November 7th release of the highly anticipated Xbox One X, one of the questions would have to be, will the Xbox One X outsell the PS4 Pro? Now let’s take a look. First, the specs of the Xbox One X is better than the specs of the PS4 Pro. The Xbox One X has even been compared to having the same experience as a gaming PC. Though both Xbox One X and PS4 Pro have the 4K and HDR support, it’s more of the power that the Xbox One X has that can outshine the power the PS4 Pro has. There also has been some speculation on whether it is worth it to get a Xbox One X or just go out and buy a gaming PC for around the same price as the Xbox One X. But that is a different story for a different time. Though the Xbox One X can out power the PS4 Pro, the only issue that can hurt the Xbox One X at its launch would have to be the $499 price. The PS4 Pro is $100 less at $399. Even without a price drop for the PS4 Pro, just by having it at $100 less than Xbox One X, most people would want to buy the cheaper item especially since the Xbox One X launch is around the holiday time. Even though Xbox One X will be able to have better visuals on a non 4K tv than the regular Xbox One, Microsoft would prefer people to have a 4K tv to make Xbox One X run the way they had envision it to run. So buying a $500 gaming console plus a new 4K tv around the holidays could prove to be a deal breaker for a lot of gamers. Of course there will be the gamers, like me, who will trade in their old consoles and games at Gamestop to help offset the high price of Xbox One X and later on buy a 4K tv down the road, especially with Black Friday and the after holiday sales where the TVs would most likely be even cheaper. Now, will Xbox One X have high sells in the first month or so after launch? I think it will have okay numbers but not nearly the numbers what Microsoft would probably like to see for the most powerful console. 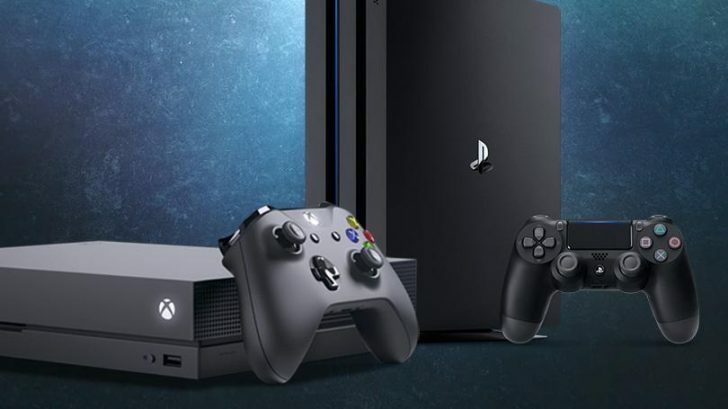 As time goes on, I think that the Xbox One X will outsell the PS4 Pro because after some time and people are actually seeing with their own eyes on how much different and powerful the Xbox One X is compared to the PS4, people will probably invest money into getting a Xbox One X. I also think that people would still keep their PS4s for exclusives and as their primary console if they are a Playstation person but by having a Xbox One X, people can experience the true 4K experience as well finally getting to play the Xbox One exclusives that they were not able to play on their Playstations. The question of the Xbox One X outselling the PS4 can also be more of which console the person prefers. Plus Xbox One X is also being held as the console for serious gamers. Now that part I doubt. At the beginning, of course, I think that the serious gamers are going to be willing to invest money in getting the Xbox One X at launch but as time goes on and the price drops on it, I think more and more Xbox people and gamers, in general, are going to be looking to get the Xbox One X. So will Xbox One X outsell the PS4 Pro? Not at first but over time, I think that Xbox One X will outsell the PS4 Pro, that is till the PS5 is announced and the specs on that are better than the Xbox One X. What do you guys think? Will Xbox One X outsell PS4 Pro in the long run or no? Good write up. If we are just talking which will sell more it’s no question it will be the PS4 Pro due to the fact that outside the US the Xbox One isn’t selling well. A new $500 Xbox with no real compelling games isn’t going to change that. I really hope the One X does succeed so we do not have to wait so long between console upgrades but there is no chance of the One X outselling the PS4 Pro. Xbox One is not selling well outside of the U.S. and the U.S. market is roughly tied (small edge to PS4). I disagree about the X not being able to outsell the Pro. People will want it because it’s a more capable system, all multiplats will look and play better on it. As the PS4 has showed us, power matters. Also, don’t forget that the PS4 didn’t really have any good exclusive AAA games to play for almost 2 years. My point here is it sold the way it did because of power–as did the PS3. To ignore that is just being disingenuous in my opinion. Your entire comment is disingenuous. It’s gonna be more expensive than the Pro or anything else, which will be a barrier to entry. It won’t have anything exclusive to really make it shine. If you’re gonna narrow it down to specifically “exclusive AAA games,” the XB1 really only had multiple Forza entries in those first two years. Even by October of 2014, PS4 had about twice as many good games. Your point doesn’t exist, because power was not the reason it sold better. There wasn’t nearly enough of a performance gap between the two for that to be the case, and it’s idiotic to hang your hat on that. The PS3 also didn’t sell because of power. Indeed, you had- and still have- numerous Xbox fanboys that say the 360 was always the more powerful console. You only try to push that now because it helps you obfuscate reality: that it was and is about the games. If it WERE about power, then you’d have PS4 Pro and not be such an obnoxious Xbox fanboy; if it WERE about power, EVERYONE would be buying a Pro, instead of just one in five. So sorry, but ignoring what you claim is more like a sensible, natural thing to do than anything resembling disingenuous. I will probably get an Xbox one X at or near launch. That being said I don’t think it will outsell the PS4 Pro. I still have my original PS3, Xbox 360 and Xbox 1 and I don’t think I’m going to invest in a PS4/pro but I think this generation PS4/pro will win in terms of numbers and they’ve got some great games out/coming out. Just to use your own argument against you: “People will want it because it’s a more capable system, all multiplats will look and play better on it” that exact argument could have been used for the ps4 pro vs the ps4, yet base ps4 has sold 4 times the amount ps4 pro has. And second son just proves your second agument to be wrong! but, if you want to compare, 2017 has ps4 with 4 or 5 more AAA exclusives than xbox before the x launches. I don’t have a 4K TV yet…I won’t for a couple years… but I am getting the Xbox One X… All Multiplat games will look and play better on the X even on a 1080p TV… with Halo 6 coming later and Ace Combat 7 & Elder Scrolls VI are going to be awesome on the X…. The PS4 Pro looks great in 4k and its cheaper. People don’t change cell phone brands from Apple to android just for a new model. The sheer price of quality 4K TVs means the newer consoles will be overshadowed. About 20% of new PS4s are Pros. So expecting Xbox to be higher is unfounded at the higher cost. That’s like expecting Xbox which currently sells less than half of PS4 to sell 45-50% of all Xbox Ones. Microsoft expects the S to outsell the X so that shuts this theory down. With Call of Duty, Destiny, Star Wars and Far Cry bundles being less than Xbox One and promoted with PS4, there is a full media blitz favoring Pro. Finally with so many more PS4 owners, it is counterintuitive to expect more Xbox games to upgrade at a higher price. It’s extremely easy to see all the reasons why the XOX won’t outsell the Pro… what’s harder to understand is why some people STILL can’t see that. What’s wrong? Don’t cry man! But once the dust settles the Pro will end up selling more $100 less if not more if Sony drops the price. I still think your gonna see PS4 Slim and XB1s sell more than their upgraded counterparts anyway. Plus the huge Exclusives, and the ones coming out. But most of all the installed player base, are all your friends really gonna switch all to XB1X? Plus all the AAA’s 3rd party PS4 DLC first games.